Tree Houses, Ziplines and More! We will work tirelessly to create that memorable, challenging and authentically natural experience for your campers, inspiring continued patronage and countless social media shares! Like Nowhere Else: Wow your guests with unique, authentically natural experiences! 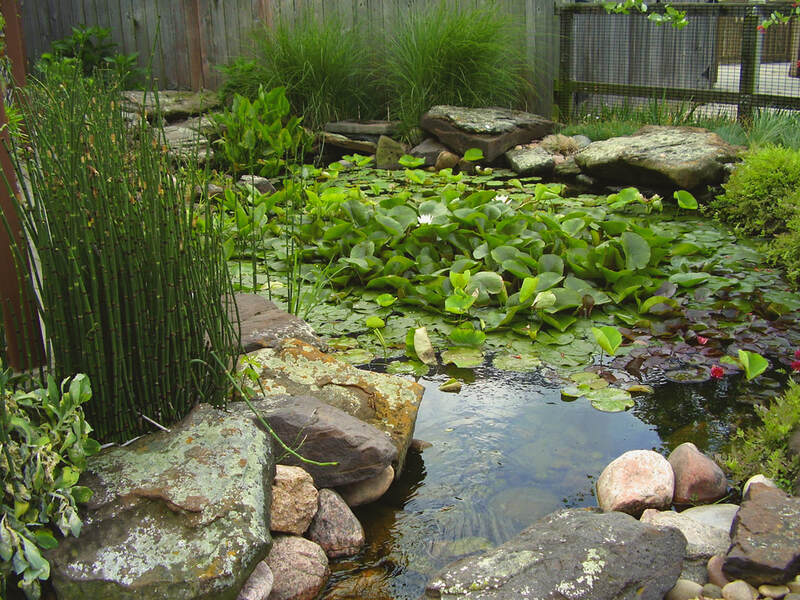 At Total Habitat, we specialize in all things natural, from using natural materials like stone, river rock and aquatic plants in the creation of our water features, to mimicking nature's own processes for cleaning water. 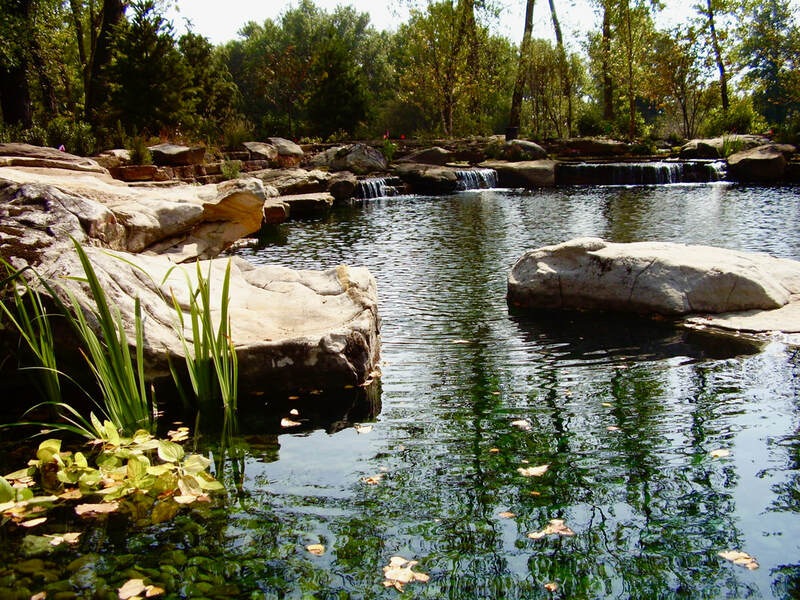 Our chemical-free Natural Swimming Pool/Ponds (NSP's), as well as our decorative ponds and streams, all feature our chlorine and salt-free biological filtration and circulation system that ensures the water stays clean and crystal-clear. 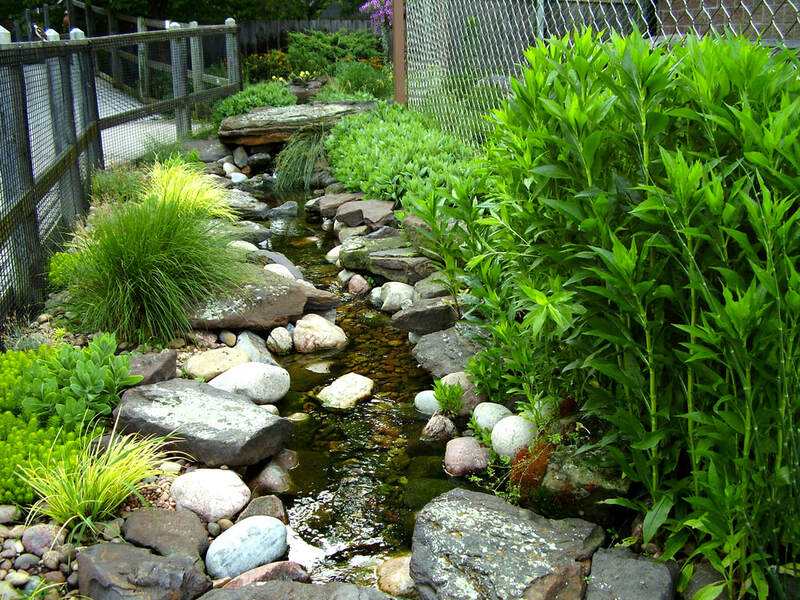 Our NSP's are more than swimming pools, they are living ecosystems that provide your guests with an authentically natural experience full of opportunities for nature learning and exploration. The secret to epic attendance levels: Create a space like nowhere else with breathtaking views all year long and stunningly shareable photo opps! Before plopping down a cookie-cutter, chemical-laden pool, call on Total Habitat to help you create a truly unique, all natural camp or retreat experience! Provide your guests with an authentically natural experience full of opportunities for nature learning, exploration and water recreation. Our NSP's provide breathtaking views and stunningly shareable photo opps all year long! Using the very same water filtration and circulation techniques we use in our Natural Swimming Pool/Ponds, we can help you to clean-up that mucky lake or recreational pond. Your guests won't be impressed to see a muddy, dirty water feature and your fish and aquatic plants will suffer too! 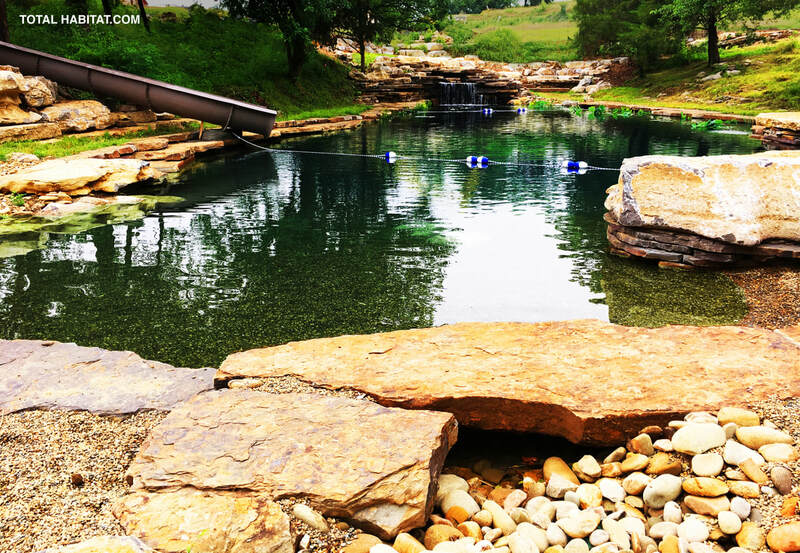 Not only can we help you to improve your water quality, we can also improve your lake or pond's swim-ability by adding in beaches, docks, piers, towers, zip-lines, jumping boulders, climbing walls, bridges, elevated walkways and more! We have over two decades of experience creating artificial rock work, from countless zoo exhibits to epic jumping boulders and naturalistic rock climbing walls! Our artificial boulders and climbing walls have an authentically natural look and feel and can be made in just about any size or shape, both indoor and outdoor! Adding a naturalistic climbing wall to your camp, either over a pool or with a top-rope climbing system, will provide your guests with a truly unique and challenging experience that will inspire a life-long love of nature and healthy risk taking! Your campers will remember the physical and creative challenge of climbing up to the top (without generic, artificial climbing holds telling them the way up) and the thrill of repelling back down to the ground or free-falling into the water below! Our climbing walls can be made to be relatively flat (such as against an existing interior or exterior wall) or can be 3 dimensional, made to look like an actual boulder or 3D rock formation with one or more climbable faces. ​Considering a regular old diving board or jumping platform for your pool, pond or lake? Instead, let us create a custom, naturalistic jumping boulder that will wow your visitors and set your experience above the rest! We can even carve in steps or a custom waterslide like this one shown above! Click Here to see it in action! Water play is a excellent addition to any camp or visitor experience. A splash pad or interactive fountain will cool off your guests, provide beautiful photo-ops and give kids (and kids at heart) a fun way to play and connect with others; which equals lasting memories and continued patronage! Our splash pads can be automated to spray in a timed sequence or at random -- creating even more excitement for guests -- and can be made in just about any shape or style desired! We can help you with design, construction and consultation services including the splash pad itself as well as its specialty plumbing and water filtration system.